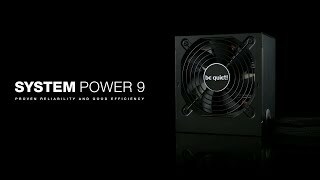 System Power U9 | 400W silent Power supplies from be quiet! be quiet! System Power U9 400W offers renowned be quiet! reliability and quietness for price-conscious PC builders. System Power U9 400W is equipped with a temperature-controlled 120mm fan. It provides you with the low noise operation that be quiet! is famous for, built into an entry-level system. The 80 PLUS Bronze certification is convincing evidence of this PSU’s efficient and power saving operation. It is a remarkable achievement for this class of PSU, realizing an efficiency rating of up to 89%. System Power U9 400W provides stable and dependable power for CPU and GPU. It is equipped with two independent 12V-rails and supports several graphics cards with two PCI express connectors for multi-GPU systems. The PSU is equipped with DC-to-DC conversion for tight voltage regulation, even under heavy cross-loading conditions. This ensures reliable operation and makes it ready for the next generation of processors and graphics cards. System Power U9 400W comes with a high-quality black sleeved 24-pin cable that adds a touch of class to any PC system. The P4+4, PCIe and drives cables are flat.